11. 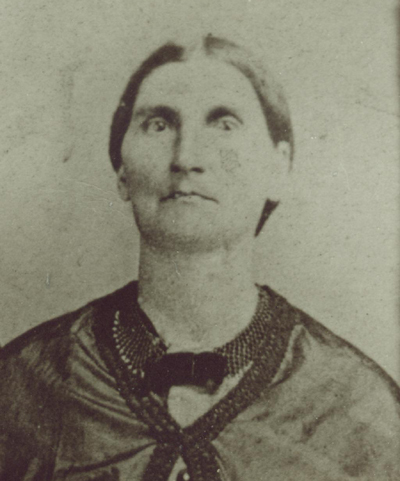 Rachel3 Cox (Joseph2, John1) was born 23 January 1809 in Indiana, presumably in Wayne County, and died on 26 December 1878 at Kellogg, Jasper County, Iowa. She married Samuel Knight in Tippecanoe County, Indiana on 15 August 1833. Samuel was born on 6 July 1799 in Pennsylvania and died on 21 August 1867 at Kellogg. He had previously been married on 10 September 1827 to Ruth Ann Johnston. Both Samuel and Rachel are buried in Rushville Cemetery. Grandfather moved from the Rock Island, Illinois area, probably about the time Sarah Catherine Cox Kirby went to California [c1855], and settled in eastern Iowa near a town called Moscow. After the Civil War things were so bad, they loaded all their possessions on a wagon and started south -- conditions still very bad; started east -- no better; so they started northeast and when they came to Alloway Creek in the Mariposa precinct, north of Kellogg and Newton, Iowa, they decided they had found all they needed -- wood and water. Samuel Knight and wife sold 148 acres in Muscatine County on 9 September 1865, comprising the SE4 of section 2, T78, R2W, except for 12 acres in the southeast corner (Muscatine Co. Land Index, vol. 4, citing Deeds 2:226). In 1870, Rachel lived in the household of her son J.S. in Mariposa township, Jasper County, Iowa. She then owned real estate worth $1600 and had a personal estate worth $400.